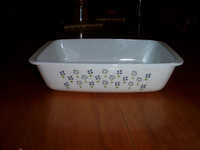 Am I the only person out scooping up vintage pyrex? I got this one for 50p last week. 6berry, I have Pyrex from years ago. I don't think that any kitchen could function without it. I have a different 'must get' it's the brown Pearsons of Chesterfield. I can't find them very often. As far as I know there are no more white with patterns on sale. They do come with a distinct disadvantage though. The patterns fade in dishwashers, and for that reason, they are probably never going to make them again. But they clean really easy in hot water, a mild scourer and washing up liquid. We use them a lot. I have a clear pyrex dish that I use to make fruit crumble but I would not say it is vintage yet! Regarding dishwashing - don't expect anything you have to be dishwasher safe if it was manufactured before dishwashers were invented! I have some lovely. traditional old pudding bowls that could well have been handed down from my grandmother which I keep rescuing from my dishwasher. I have a set of lidded Pyrex dishes - some are clear glass and some are tinted. Very handy for allsorts. Handed down from my mum. I also remember her having some white ones, and think she still uses a couple. You tend to see them in charity shops a lot - I guess when people pass away and the relatives clear out the houses, many of these are found in backs of cupboards. 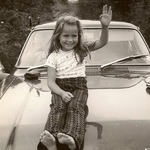 We used to have an oval one that sat in a metal cradle. You lit a tea light underneath and it was designed to keep food warm. The cradle does add to the value. I had never heard of cradle pyrex, must have been quite the talking point during dinner parties, way back then. The cost of the postage is off putting, not that I would buy any. I got this one today from a charity shop. It was £1.99. I am thinking of my mum and dad when I see this 6herry, I think they had one of these gravy/sauce boats, not this pattern though, they had the flowers, yellow and brown, and I remember cups with a pattern of red lines around the rim. Is this the start of your collection, or have you been buying for a while? I am wondering where all my mum's pyrex ended up? I think it will answer that question if I say, "I will have a look and see if I have your mum's pattern?" We must have about 50 pieces in total now, we have been collecting it for a while. It is called Briarwood, and is worth £10 - £20 plus postage on ebay. I got this one recently for £1 it is unchipped, which is very important.